Gain insights into the story of a galvanizing man who is not just following his passion but continues to share opportunities with others, with a vision to help them get what he was deprived of, in his journey of life. As I walked into his academy early morning to catch up with him, I was welcomed by a bunch of students who were up on a Sunday morning to keep their feet going in the sandy grounds of S.V.E.S school in Vidya nagar, Hyderabad. All around were pictures of great legends along with the future legends from his academy. Not to forget a white board with a thought, that said ‘If you do not get what you like, check what you are giving.’ It shows the atmosphere created by Daniel for the launch of great missiles into the fathomless cricketing world. His childhood was just a gully cricket tale and lacked the guiding force that could take him to meridians of world cricket. He recollects that he had spent hours together playing cricket in the streets of his colony but never found the godfather who could tell him about the wonders that he could do on a real cricket pitch. 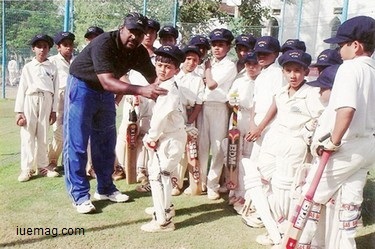 Nevertheless, the zeal in him to follow his heartbeat (sounds of cheers in a cricket stadium) drived him towards the profession of coaching younger minds and further led to the establishment of Daniel’s Cricket Academy. He mentions that his mother has always remained as a special person in his life and it was with her support that his academy has come into existence. He now runs three branches, one in Vidya nagar which is the birthplace of this glorious landmark, the other two in Uppal and Jubilee Hills. 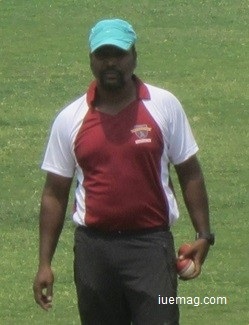 DANIEL KANAPARTHI is a Level II certified Coach from England and Wales Cricket Board (ECB, United Kingdom) and is also an active member of England and Wales Cricket Coaches Association. He says a person doesn’t need luck to receive applauds but just perseverance and belief in your mentor does the trick. According to him, LUCK in cricketing terms is ‘Labor Under Correct Knowledgeable person’. He remembers a special incident in his life which taught him the impact of supporting words. It was during a match against SBI where he had to return to the pavilion after playing a bad shot. His senior and mentor walked up to him saying, “Daniel, you being the team’s best batsman, I never thought you would play such a bad shot”. He says that if he knew that he was considered a top player of the team by his mentor and had he said that to him before entering the crease it would have fuelled up his game a 100 times. He now implements this technique while training his students, that is, unleashing their potential by placing his trust upon them. 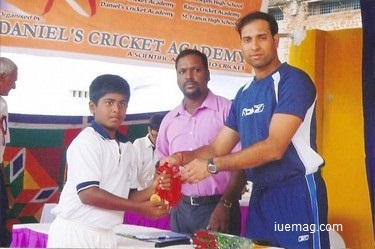 Daniel’s academy aims at maintaining quality coaching standards and contributing best cricket players to India. He looks forward to getting associated with the BCCI (Board of Control for Cricket in India) in the near future. A person whose fate did not take him to the apex of cricket due to lack of awareness, now wants to fulfill the ambition of every aspiring and cricket loving kid. DANIEL - Dedicated, Ambitious, Noteworthy, Industrious, Enthusiastic, Lustrous - This abbreviation defines and shall continue to define his way of life. Any facts, figures or references stated here are made by the author & don't reflect the endorsement of iU at all times unless otherwise drafted by official staff at iU. This article was first published here on 17th March 2016.